Google is very clever and can detect when you’re trying to cheat to get a higher ranking. Stuffing page content with keywords and key phrases is what people do when they want their site to get a high ranking for a popular search term. When this is done it is known as keyword stuffing. People who don’t know much about SEO or those who are trying to cheat the system will try and get away with using this method. Google will penalise you if it thinks you’re guilty of doing this within your content. Are you guilty of being a keyword stuffer? What exactly is keyword stuffing? A block list of countries, cities and counties that site is trying to rank for. Not only does it look unnatural but also causes a negative user experience. Therefore anything on that site is difficult to understand due to there not being a natural flow to the content on the page. Having unnatural content almost guarantees you will have a very high bounce rate. People may click on your site but they certainly won’t stick around after reading two sentences with the same keyword or keyword phrase repeated in anyway possible. 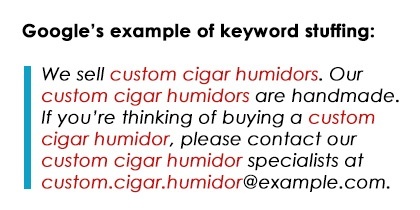 Online visitors won’t be getting any useful information from your site, only that you sell a certain product such as ‘custom cigar humidors’. If you find a website difficult to read because of too many keywords, it’s unlikely you will return to the site. This means these types of websites could generate less traffic to their sites. Website owners have found sneaky ways to avoid this issue by changing the text colour of the keywords and keyword phrases to white so viewers can’t see it. Whilst online users might not be able to see them, search engines can. When they crawl a website, search engines can see keywords hidden around the site and if they have been stuffed in the meta data and alt text. Even though viewers might not be able to see all the background caos, Google’s algorithms can and they won’t be happy with websites that try to cheat the system. Can you get punished for it? The answer to that is yes! In the past, this method worked for many people and their websites which got them the higher rankings. However, Google has gotten older and wiser and will not fall for those tricks anymore. Keyword stuffing might get you a higher ranking for a short period of time but Google has clued up and will now penalise you if it detects any form of keyword stuffing. The punishment is to drop you to a lower ranking or to even remove your site completely off Google. Therefore, in the long run, it isn’t worth the risk of achieving that higher ranking for a measly few hours. The best way to avoid feeling the need to stuff keywords in your content is to just forget that it even exists because it does more damage than good. Concentrate on filling your site with amazing content that includes keywords that are relevant to the topic. Make sure you avoid repetition and duplicate content. There are plenty of ways to get a higher Google ranking naturally. Keyword stuffing is not the answer! Want the ultimate Google rankings cheat sheet? Getting your keywords right is only one step to getting higher rankings in Google. We've collected the 22 ranking factors you need to master. Download our FREE cheat sheet to boost your rankings now. These 5 Web Design Myths Are Killing Your Conversion Rate!